New safety kit for Mercedes and Infiniti | What Car? 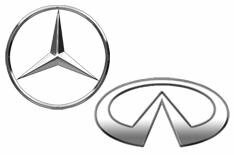 New safety systems that actively prevent cars from straying into the paths of others will become available on top-end Mercedes-Benz and Infiniti models this autumn. Both are extensions of systems already available. At the moment Mercedes and Infiniti offer blind-spot and lane-change warnings that alert the driver if the car is about to move into the path of another coming up behind, or drift unintentionally into another lane. The big difference with the new active systems is that they apply the brakes on one side of the car to bring it back onto a straight course, even if there is no immediate risk of a collision. The driver will also be given warnings, as at present. The Mercedes systems are called Active Blind Spot Assist and Active Lane Keeping Assist, and will initially be available on the revised S-Class saloon and CL coupe plus the E-Class family. They will come as a package for 2020. Infiniti calls its rival systems Blind Spot Intervention and Lane Departure Prevention. Both are standard on top-end versions of the M saloon, while the Lane-departure system is also on the most expensive versions of the EX crossover and FX off-roader. They are not available as options on other models. Mercedes' active blind spot feature operates between 20 and 125mph, although a visual warning a flashing red triangle in the door mirror will be given right up to the maximum speed of 155mph. The active lane-change system works between 35mph and 125mph as long as there is a solid white line on one side of the car and a dotted line on the other. The system cuts in if there is a gradual drift off-course so that it will not prevent the driver from suddenly swerving to avoid an accident. In the Infiniti, both systems operate between 45 and 75mph.